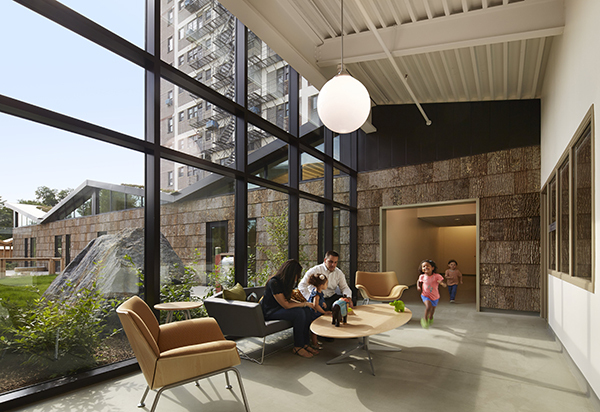 Bark House shingles, shown here in the University of Chicago childcare center, were recently certified as the first Cradle to Cradle (C2C) Platinum products. Cradle to Cradle (C2C) was the first certification to attempt to define in 2005 what true sustainability might look like in a building product. Since then, several hundred products have been certified at C2C’s lower levels: Basic, Bronze, Silver, and Gold. But until now, Platinum certification, the highest level, has appeared more aspirational. The first product to achieve C2C’s highest bar? Bark. Specifically, Highland Craftsmen Inc. Bark House shingle and wall panels. The product is made from tulip-poplar tree bark that has been reclaimed from logs, flattened, dried, and trimmed into a durable finished product. A product’s overall rating is based on its lowest score in these five categories, so if you had Platinum for social fairness but Silver for water, you can only get an overall rating of Silver. It’s clear that C2C Platinum was harder than we thought. Material Health: Bark House shingles are 100% bark with no additives or coatings. Material Reutilization: The bark is harvested from trees that are already on their way to the sawmill. At the end of their useful life, the shingles can be composted, mulched, or otherwise returned to nature. It should be a long life: the company has been around for 25 years and says it monitors installations of similar bark shingles that pre-date it by another 60. Water Stewardship: No water is used in manufacturing, and the company participates in regional river and stream stewardship. Clean Energy and Carbon Management: All of the electricity used to make the shingles is generated with onsite solar power. The company keeps its footprint small by harvesting 90% of raw materials within 50 miles of its facility. According to the company, it dries its bark with gas-fired kilns and makes up for those carbon emissions by generating excess onsite solar power. The company also manages its carbon footprint with its product, which keeps carbon out of the atmosphere for much longer than it would otherwise. The bark would normally degrade naturally or be burned, releasing its carbon much sooner. Social Fairness: Highland Craftsmen is B Corp-Certified. The B Corporation framework is used by companies that have a mission to support the environment and their communities, and to provide optimal working conditions. This area of the C2C standard is also where material-specific certifications are covered. The company told BuildingGreen that it has worked to maintain a Forest Stewardship Council (FSC) certified supply but has been unable to do so because of lack of demand and FSC’s lack of scalability for small Appalachian landowners. The company meets C2C’s requirements for social fairness in part by supporting logger education programs that address sustainability and worker safety. “Achieving an overall Platinum certification demonstrates the depth and commitment of the company’s efforts to provide safe products that can be perpetually cycled and are manufactured in ways that respect humans and the environment,” commented Stacy Glass, vice president for the built environment at C2CPII. Bark House shingles come in a standard grade as well as a thicker, premium grade that has deep furrows and more-pronounced shadow lines. The company’s interior-grade shingles and large wall panels are certified Gold under C2C. These are a more complex product: they can be laminated to order (low-emitting substrates are available) for use in cabinetry or wall mounts, or as an interior wall covering.